Spend the last night of the year with thousands of your closest friends, hours of live music, fireworks, and the signature midnight Music Note Drop. Get ready for a happy new year. Thank you for coming out to rock out 2018 and ring in 2019 with us in Nashville! The Fisk Jubilee Singers, Devon Gilfillian, Caitlyn Smith, Judah & the Lion, Brett Young, Peter Frampton, and Keith Urban helped us celebrate in real Music City style. 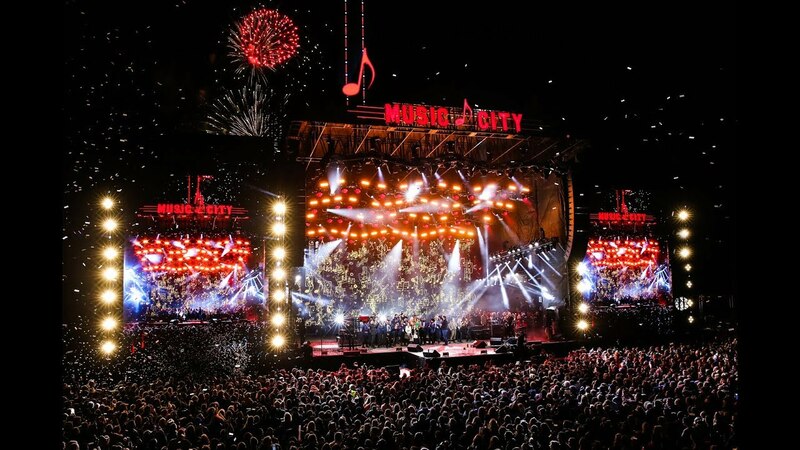 Last year, The Fisk Jubilee Singers, Devon Gilfillian, Caitlyn Smith, Judah & the Lion, Brett Young, Peter Frampton, and Keith Urban rocked the stage during the free Music City Midnight: New Year's Eve in Nashville celebration. New Year's Eve in Music City promises stellar entertainment, stunning fireworks, and so much fun! There's a lot of music, there's confetti, a Music Note Drop, and fireworks. But there's also food, drinks, and whole lot more fun to be had at the Jack Daniel’s Music City Midnight: New Year’s Eve in Nashville celebration! Learn all the fun things about Nashville's New Year's Eve, like the number of lights in the giant music note or how many pounds of confetti are used at midnight. Get the schedule for Jack Daniel’s Music City Midnight: New Year’s Eve in Nashville so you don't miss a minute! Does it cost anything to see the concert or attend the event? Keith Urban, Peter Frampton, Brett Young, Judah & the Lion, Caitlyn Smith, Devon Gilfillian, and the Fisk Jubilee Singers will play the 2018 event. It's going to be so good! Yes. Stay tuned for those details. The event site opens at 4pm on December 31. Plan to visit partner exhibits and vendor booths throughout the day. Raising of the music note starts around 6:15pm. The whole party takes over Bicentennial Capitol Mall State Park in downtown Nashville. Will there be a big, sparkly ball that will drop at midnight? No, we're Music City. A 16-foot-tall red music note will drop 140 feet at midnight - it's Nashville's signature Music Note Drop®! Of course. The midnight Music Note Drop® will trigger a fantastic fireworks show at midnight as we ring in the new year. All ages are welcome. You must be 21+ to purchase alcoholic beverages. So, there will be alcohol for purchase? Yes, alcohol is available for purchase by guests 21+. IDs will be checked for all those wishing to purchase alcoholic beverages. hat if I have questions and need help from a friendly face? Make your way to our Nashville Information Booth located at the parking lot at the corner of 6th Avenue and Harrison Street near the food trucks. Can I get official Music City Midnight merchandise? Yes! You can purchase the official shirt, koozie, shot glass, magnet, and more at the merchandise trailers on December 31. One trailer will be located in the parking lot at the corner of 6th Avenue and Harrison Street near the food trucks and another trailer will be located along 7th Avenue near the beverage stands. Do you have lockers to rent? Yep! The locker rentals will be located to the right of the entrance located at 6th Avenue between James Robertson Parkway and the train tracks (see a map). Anyone at the event can use them and you will have one hour after the event to retrieve your belongings. They can accommodate anything, but prices might go up depending on the size of the bag. Absolutely. You will not go hungry on New Year's Eve. Nashville food trucks will be set up around the event site, serving local Music City food. See a list of food trucks at: visitmusiccity.com/newyearseve/nye-fooddrinksfun. Nashville is friendly to everyone. But please keep in mind the nature of the event: there will be tens of thousands of people celebrating at this event. Alcohol will be served. Music and fireworks can be loud. There will be a special Raising of the Note at the beginning of the night that families might enjoy. Be comfortable! Watch the weather and dress accordingly. It is unseasonably warm, but may also be a bit damp. The event takes place in a park and you may be on grass, so choose your shoes wisely. What if my phone is on 10% battery life!? Then, head to one of our merchandise trailers located in the parking lot at the corner of 6th Avenue and Harrison Street near the food trucks and along 7th Avenue near the beverage stands to purchase one of our battery packs to charge your phone! Can I access free WiFi? But of course. We want you to post about all the fun you're having at #NashvilleNYE! You can jump on the free NashvilleNYE Wi-Fi network. Vehicle parking will be available at Nissan Stadium for $10 in Lots R and E (open at 8 a.m.) and Lots A, B, D, and F (open at 2 p.m.). RV parking in Lot P for $40. Additional parking options include: $15 for vehicles at the Metro Courthouse Garage; $14 at Nashville Public Library Downtown ($10 after 5 p.m.). To locate parking downtown, visit www.parkitdowntown.com. If I don't want to drive, what's the best way to get downtown on New Year's Eve? There are plenty of options for transportation. Yep! There will be bathrooms located along 6th Avenue, 7th Avenue, and Harrison Street. Is there a picture-perfect spot to grab a snapshot to remember the event? Yes! You can snag a shot at the GIANT Advance Financial Picture Frame located towards the back of the site near the front of the Bell Carillon, the "2019" Sign located towards the back of the Bell Carillon, the Nashville Smile Bar located at the Social Media Zone, the Selfie Station located at the Food Truck Court, and more. Can I bring a chair and a cooler? No, for the safety, comfort, and convenience of everyone, neither chairs nor coolers are permitted. View visitmusiccity.com/newyearseve/nye-houserules for more information on what can and cannot come into the event site. There is an ADA riser near the Nashville Farmers' Market. Space is limited and on a first come, first served basis. For information on the closest available parking lots or garages, visit parkitdowntown.com. What if I lose something? Where can I find it? On the night of the event, you can visit the Nashville Information Booth located at 6th Avenue and Harrison Street near the food trucks. You can visit the Visitor Information Center located at Bridgestone Arena for any items not claimed on December 31. Is there an official event hashtag? YES! It's #NashvilleNYE. Use it in all of your posts and follow along for the fun. Where do I go for event updates, schedule changes, weather plans, and for answers on anything else I want to ask? Follow @VisitMusicCity on Twitter. We'll be sharing all the goods throughout the day and night! Is there an area to step inside and escape the weather? Yep! Two, in fact. There is a heated tent located near Jefferson Street between 6th and 7th Avenues with craft beer merchants serving Wicked Weed, Elysian Brewing Company, and Devil's Backbone inside. Also, there will be a large "Grab & Go" Heated Tent located along 6th Avenue near the concert viewing area (see a map). 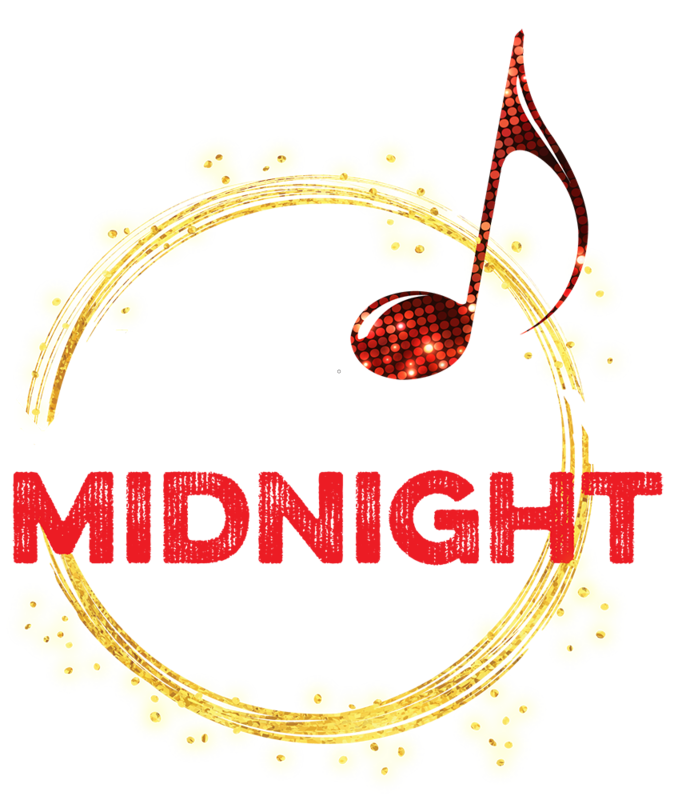 We will show the Jack Daniel's Music City Midnight: New Year's Eve in Nashville from 11:30pm on December 31, 2018 to 12:30am on January 1, 2019 at visitmusiccity.com/newyearseve. Absolutely! You can download Nashville's New Year's Eve App in the App Store or Google Play. Find more information at: visitmusiccity.com/newyearseve/nye-app. Because it's the best way to spend the end of the year - and the beginning of next! Yep. The smoking area is located at the parking lot near the train tracks at 6th Avenue and Harrison Street. View a map for the location. Absolutely! The ATMs are located at 7th Avenue near the beverage stations, Jackson Street near 7th Avenue, 6th Avenue near the beverage station, and 6th Avenue parking lot near the food trucks. View a map of these locations. We hope you don't get hurt this New Year's Eve but if you do, please visit one of our First Aid Stations located at 7th Avenue near the beverage stands, Jackson Street near 7th Avenue, 6th Avenue near the beverage stands, 6th Avenue parking lot near the food trucks, and near the "Grab & Go" Heated Tent off 6th Avenue. View a map for exact locations. Find out where to park, where to get a ride, and more. Many roads will be closed during the Let Freedom Sing! Music City July 4th celebration. Read more. Thanks to all of our wonderful sponsors who make Let Freedom Sing! Music City July 4th a success!